For most of us, the kitchen tends to be the heart of the home. We spend so much time there! Cooking, eating, feasting, and enjoying friends and family. However, it also tends to be one of the most difficult rooms to keep organized. 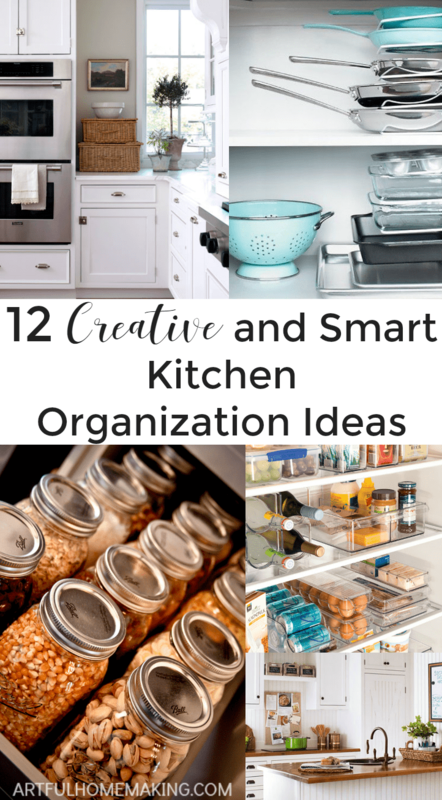 Here are 12 kitchen organization ideas to inspire you! One of my goals for this year is to gain a greater level of organization in the kitchen. Here are some of the best ideas I’ve come across. I have always been a huge fan of baskets . And they can often be found inexpensively at discount stores and thrift shops. They bring such a homey atmosphere to the kitchen. 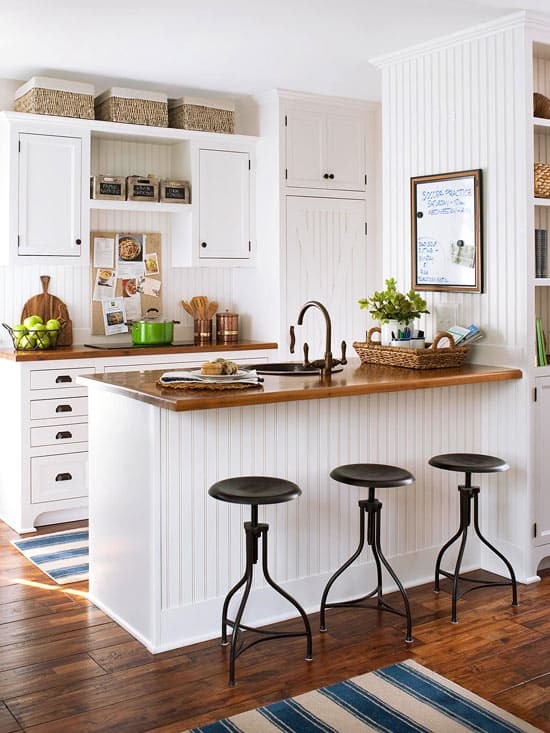 I love how this kitchen has baskets above the cabinets for rarely-used items, and I also love the use of a shallow basket on the island. LOVE all the baskets in this pantry! I think this idea is genius! You’ll always know where to find just the right measuring spoon or cup! Isn’t this pantry beautifully organized?! I just love it! 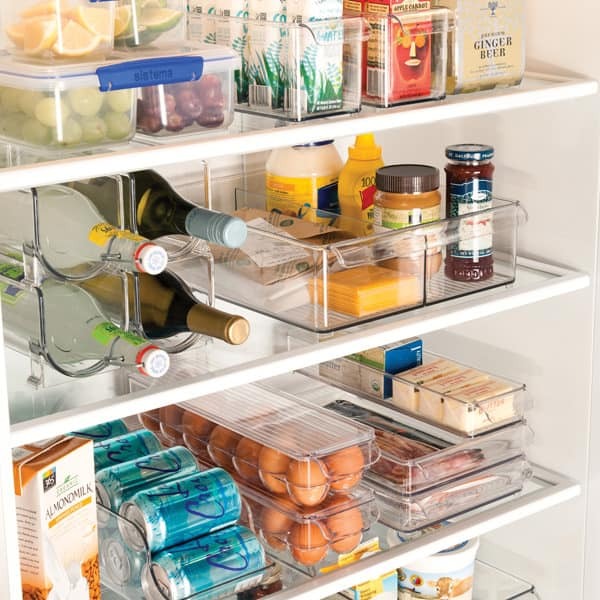 Just seeing this photo made me want to go out and buy a whole set of the OXO containers to store all of my pantry items! I want a whole set of these containers for my fridge! Last week I bought a couple of pieces, and I’m hoping to add to my collection over time. 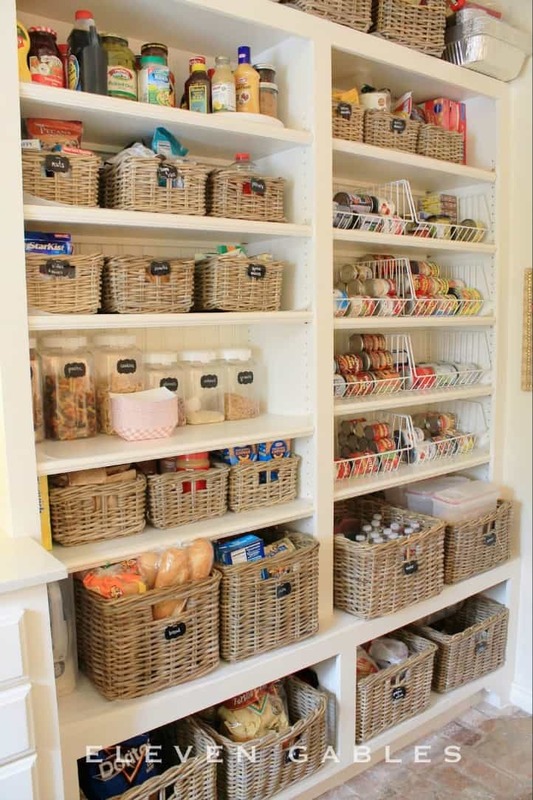 I love this pantry’s use of wire baskets ! They look so old-fashioned and modern all at the same time. 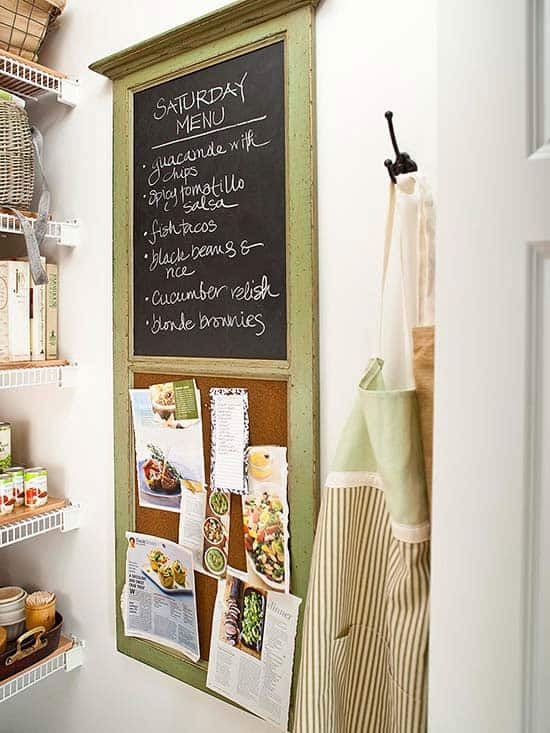 Every kitchen can use a chalkboard ! I love the old-fashioned look of this chalkboard/corkboard combination. 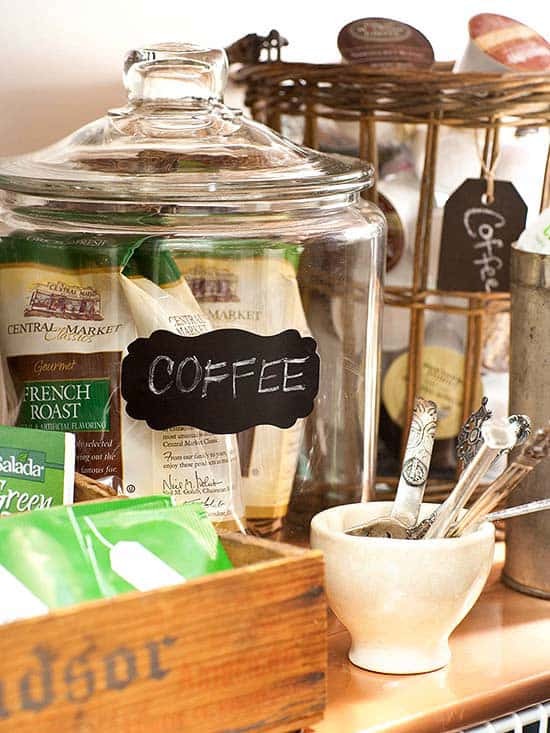 Chalkboard labels are useful and stylish at the same time. I love them in any room, but they seem particularly suited to kitchen organization. These pan organizers make grabbing the right pan a simple matter! We desperately need one of these in our kitchen. This is such a clever idea! Mount a magazine file inside a cabinet door to hold all those narrow boxes of plastic wrap, wax paper, and aluminum foil. I really love this idea. And it helps that I inherited quite a few half gallon mason jars from my mom recently. This is such a great idea! Sew some velcro to the back of your towels so they don’t end up on the floor (or maybe that just happens at our house)! 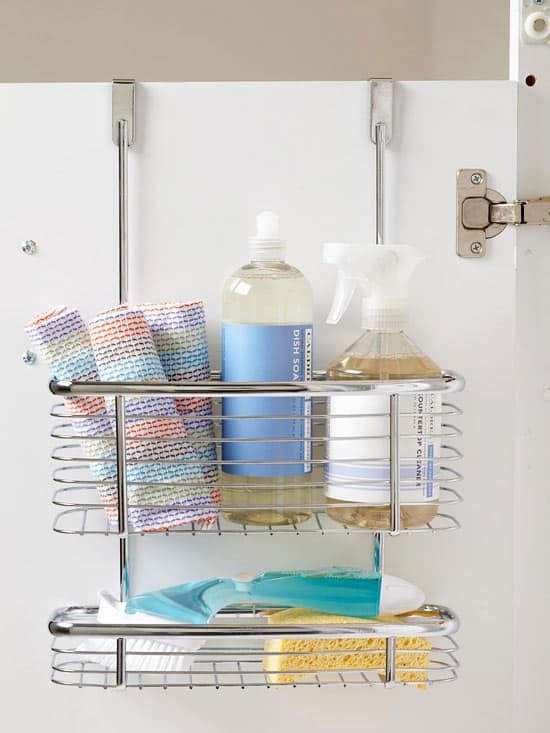 Always keep your cleaning products within easy reach by mounting an organizer on the inside of your cabinet door. There are lots of cabinet door organizers to choose from! I hope these kitchen organization ideas have inspired you as they have me. I’m ready to tackle my kitchen now! 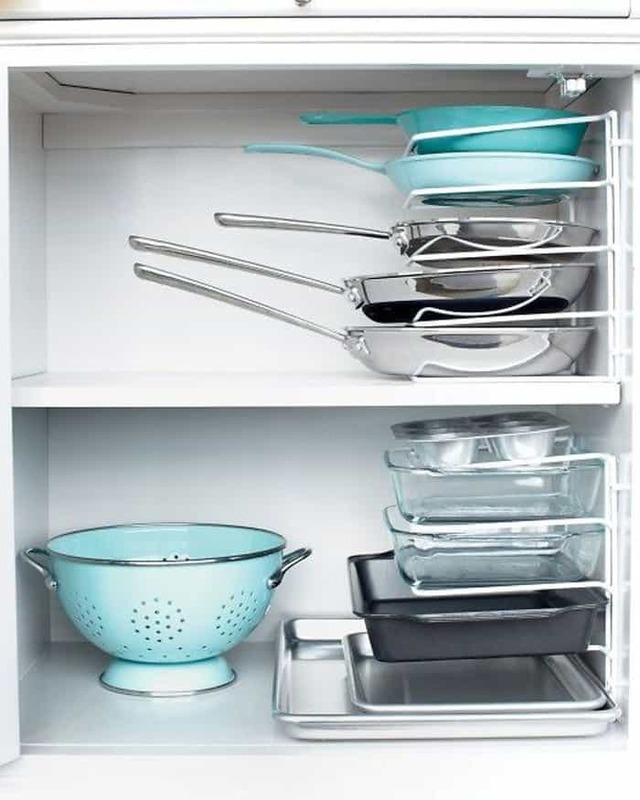 What are your favorite kitchen organization ideas? This post contains my affiliate links. Read my full disclosure here. Sharing here. 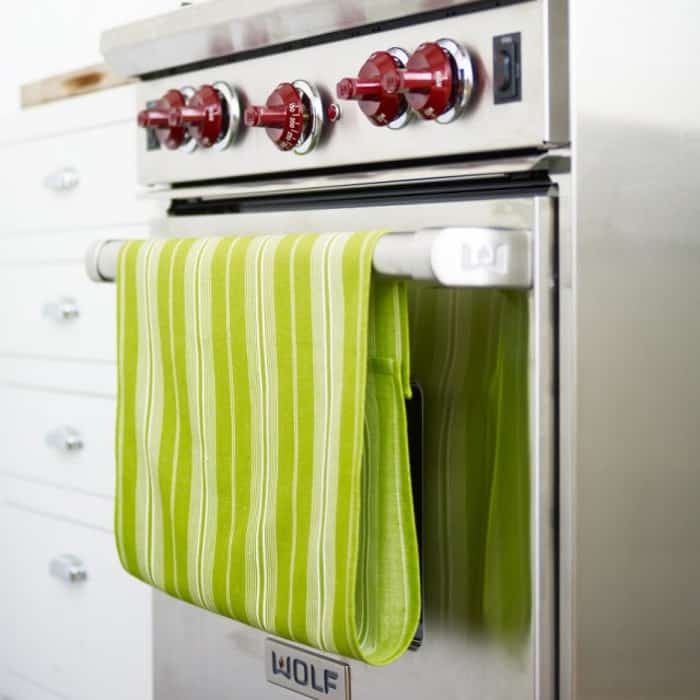 Great tips and I especially like the Velcro the kitchen towel idea! The kitchen can be such a challenge to keep organized! Happy New year to you also! Those are all great ideas, and those pantries are drool worthy!! Makes me want to go home, take everything out of my teeny tiny pantry, and start all over! I love some of these ideas! I’m going to pin this post for later use! So glad they were helpful! Great ideas! I especially like the baskets and canning jars. I store lots of things in jars because I don’t like plastic. 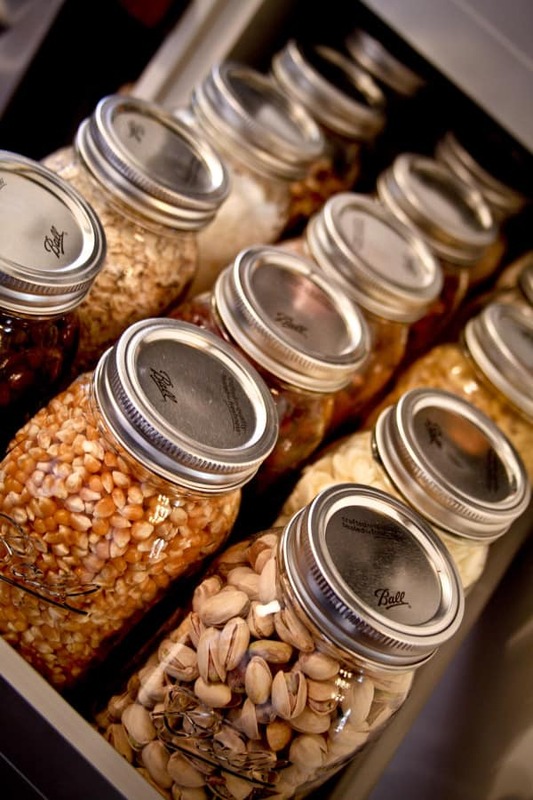 I agree with you on the plastic—my pantry is full of glass jars for this reason! 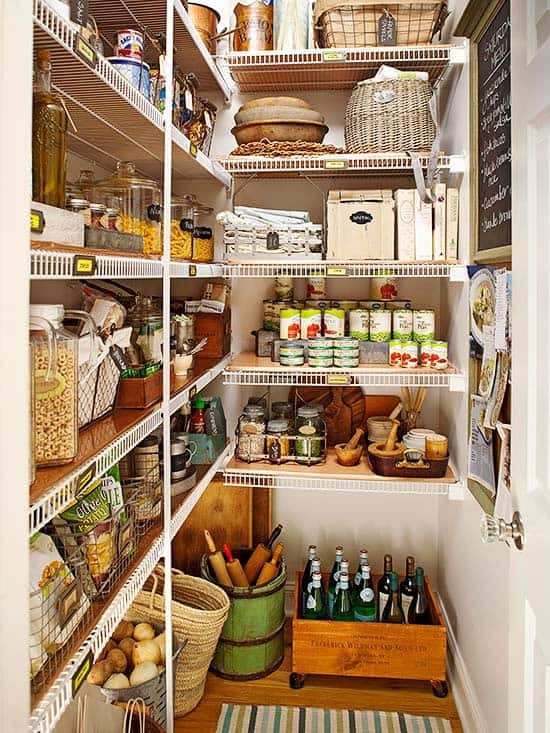 Oh my goodness what wonderful ideas – and what beautiful pantries! Thank you so much for sharing this post, Joy. I’m featuring it at the Hearth and Soul Link Party this week. Hope to see you there. Have a wonderful week! Thank you, April! And thanks so much for the feature! Love these ideas! thanks for sharing your post on the Simple Homestead Hop! going to feature your post this week on the Hop. 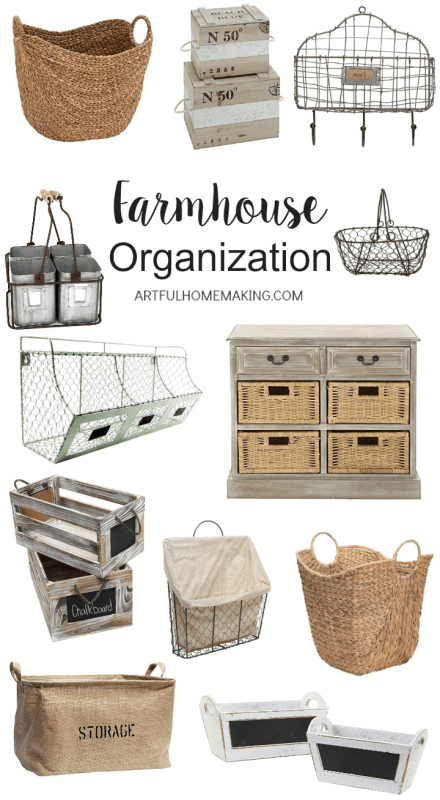 I’m always looking for more ways to be organized! Thanks for sharing. Thanks for stopping by, Wrae! Love your ideas – I want your kitchen and pantry. I will begin by collecting mason jars! Thanks, Sue! I only wish these photos were of my own kitchen! I have gleaned so many ideas from other creative ladies. I inherited boxes of Mason jars from my mom, and I’ve been gradually switching all the things in our pantry to jars. I love the way they look! I really like the idea of using the inside of the cabinet door for storage! I agree, it’s such a great use of every available space! I love all the great ideas! This is one of my featured picks at the Over the Moon link party this week. Thank you, Shelley! And thanks so much for the feature! 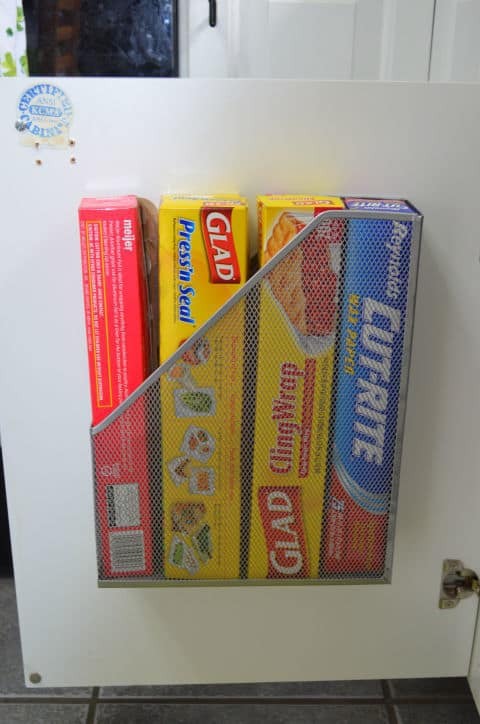 The magazine file is a great idea for the inside of a cabinet. The over-the-door hangers never fit my cabinets, so the magazine file would work! I know what you mean about the over-the-door ones—just tried some recently and had to return them since they didn’t fit! #11 is my fave! Could also use buttons. Some really great ideas that add a lovely, decorated touch, too. 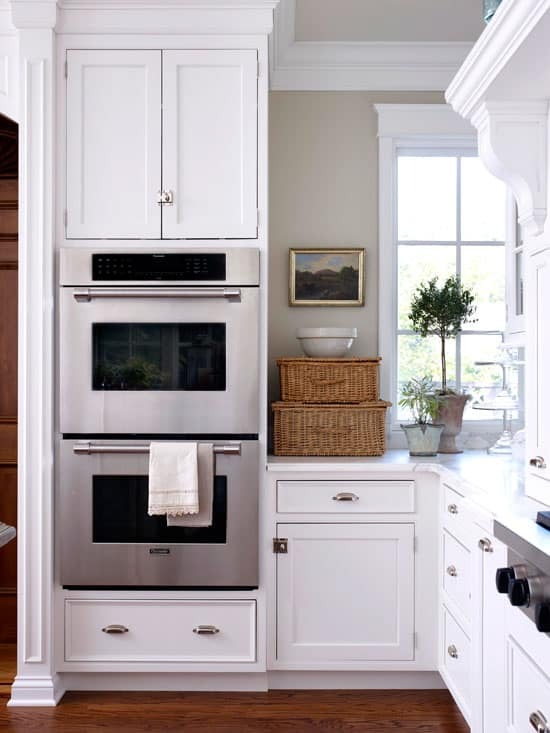 I love the idea of using baskets in the kitchen (and not just the pantry, for example). Never would have thought of that! I agree, the baskets are my favorite! Great round up of ideas! If only I could keep picture-ready organization! Thank you for sharing your post! You will be the feature on this weeks Friday at the Fire Station link-up! Great tips! My small pantry is in serious need of a clean out! Wow! These are great tips! I actually have that metal magazine rack! I am definitely going to give that a try!! 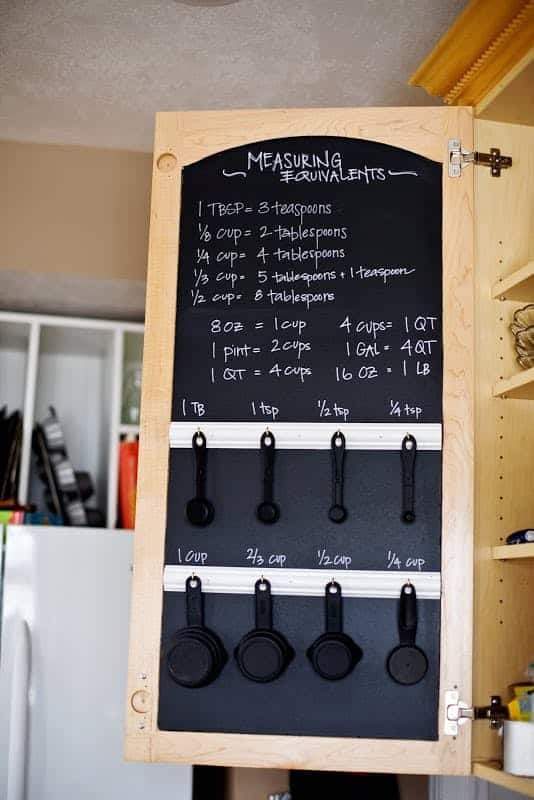 I also LOVED the measuring cups and the measuring spoons along with the chalkboard paint with measurement equivalents. How fun that you have that magazine rack! I agree, I love that measuring cup/spoon idea. Just moved after 22 years in the same home, and I really enjoyed these ideas. I’m a huge basket and mason jar person. But I needed help in how to utilize the inside of the cabinet doors. Great round-up! Thanks for sharing! Perfect timing! Our kitchen is non-existent right now, but once we get it back, I’m definitely going to be looking into these ideas. Thanks so much for sharing at the #happynowlinkup! Thank you so much for hosting, Leslie! Such great ideas and very clever! Thank you! I love the ideas, especially the pan organizer. Thanks for sharing. I am near you on the Teaching What is Good linkup. Thank you, Mary! So glad you stopped by today! Great ideas! I never get tired of using baskets, especially! Thanks, Donna! I agree about baskets! These are some great ideas! Thanks for sharing. Thanks for all of these organization ideas! I will have to put some of these ideas to use! I pinned this post and I’ll be back to visit again! Thanks for visiting and sharing, Natalie! I love the baskets! I have just the spot that needs them as well. Baskets are my favorite! I love using them all around the house. Such great ideas! I am currently in love with baskets in the pantry. Thanks for sharing. Great tips as we remodel our home. Love this! Such great ideas in one spot! We just added on a new kitchen to our house so I am trying to make the most of our new space! Thank you, Rebekah! And congratulations on your new kitchen!! Oh, thank you so much for featuring my post, JES! Great ideas! I’m definitely pinning!